Workers of a garments factory in the Cavite ecozone went on strike yesterday morning in response to the mass termination of 16 union officers. However the picketline setup by workers was torn down by an official of the Cavite ecozone administration and the Philippine Economic Zone Authority (PEZA) police. “We condemn the harassment by Cavite industrial relations officer Mr. Lindon and the head of PEZA police, a certain Mr. dela Cruz, of the legal strike by Dong Seung workers. Just like during the strike by women workers of the electronics company Lakepower Converter last December, PEZA is actively suppressing the right of workers to peaceful concerted activities. These are gross violations of the Joint DOLE-PNP-PEZA Guidelines in the Conduct of Security Personnel During Labor Disputes,” declared Dennis Sequena, coordinator of the Cavite chapter of Partido Manggagawa (PM), which is assisting the striking workers. The strike continues today with scores of Dong Seung workers conducting a roving picket. This morning, PEZA police once more harassed the striking workers and prohibited their use of a megaphone while conducting a protest program in front of the Dong Seung factory gate. Members of the union are also being stopped and prevented from entering the Cavite ecozone. 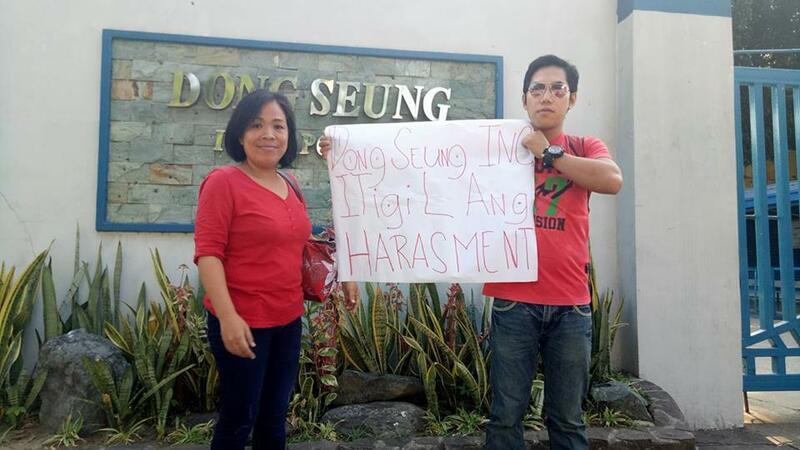 Last April 27, Dong Seung workers and their supporters trooped to the Cavite ecozone main gate to protest the union busting and call for respect for freedom of association. The rally followed a forum in which Cavite ecozone workers aired their grievances about low pay, insecure jobs, verbal harassment and excessive work quotas. “The firing of all 16 union officers, including the union president, was the latest in a series of union busting moves by management. Moreover it is a maneuver done in bad faith as the union just withdrew a notice of strike earlier filed. The retraction of the strike was part of an agreement mediated by the Labor Department wherein workers will be accepted back to work after an investigation by management,” explained Juanito Diaz, president of the Dong Seung Workers Union-Independent.